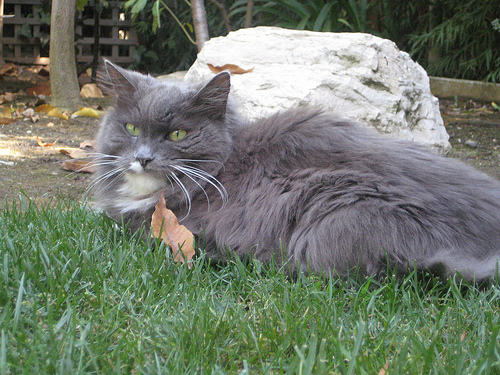 Came back from Czech Republic, and one night I was snuggling with gG on our couch when I heard a big noise outside on my front porch. 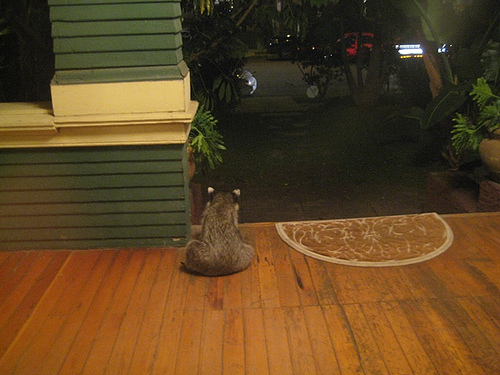 Guess who I found watching the street for us from our front porch. September went by so quickly as we were going through lots of changes in our lives. 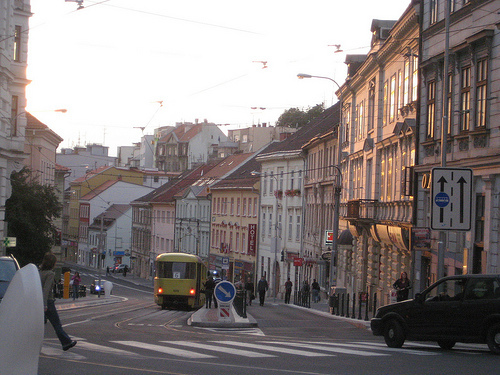 Yep, my hubby got a job offer in Czech Republic. 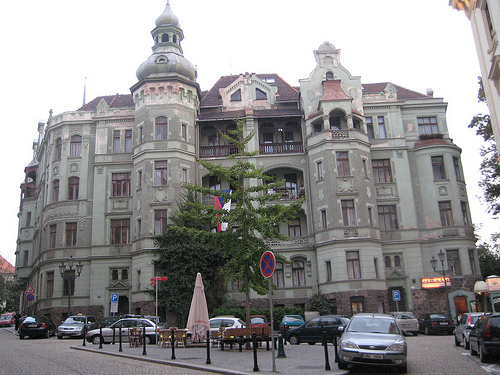 He spent most of his time this summer working as a consultant for a company in a town called Brno, and they decided to offer him a job. 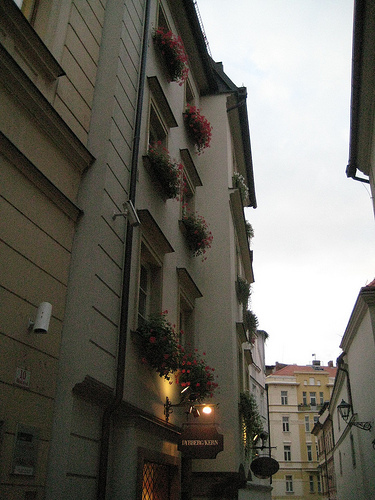 Brno was indeed a beautiful city. The center of city is very small. You can basically walk from end to end in 30 mins or less. That's one thing that I loved about the town. It reminded me of my hometown Shizuoka in a way. Another thing was the cleaness of the town. Streets were clean, buildings were old but very clean, and people were so behaved. It might be the influence from the communist time, but there seems to be enough of everything but not too much of everything. 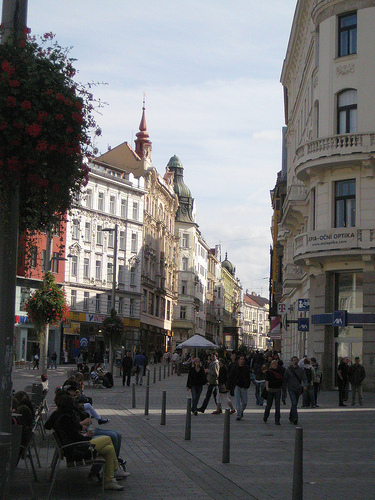 Here are some pictures from Brno city. I have been living in LA for almost 10 years, but I never went into the building called Little Tokyo Galleria Market. The building is semi empty but has several stores including Utsuwa no Yakata, discount shop, and several Japanese restaurants. The grocery store there turned into a Korean store, but you can still get lots of Japanese items in there, too. 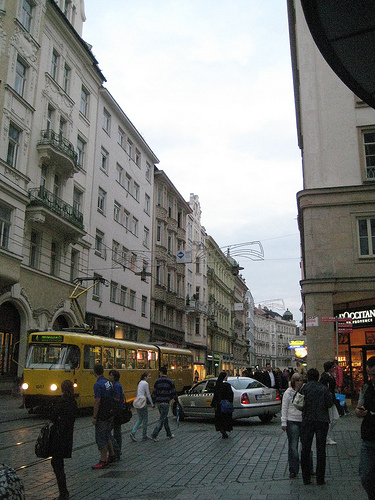 Anyway, the purpose of this trip was to look for some souvenirs we will take to Czech Republic. We used to go to a store called "Wabi Sabi" which used to be in West Hollywood whenever we wanted to get something nice from Japan. They eventually moved to Santa Monica, but I heard they closed off. Too bad. We really liked the lacquer dishes and trays they had. So, I did some search and found this place called "Utsuwa no Yakata." 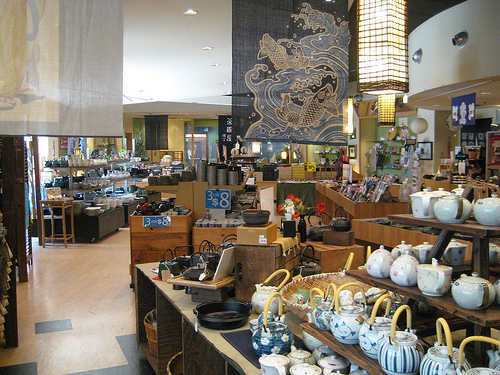 The store got variety of tableware and other cool stuff like "noren" and handmade artwork. They also had a set that you can use to do tea ceremony. Believe it or not, I used to do tea, meaning I learned Sado - how to serve tea in a traditional ceremonial way when I was in Junior High School (okay, long time ago). The tea served in Sado is differnt from the tea you are used to drink at the American sushi places. It is called Matcha, and it is finely powdered. The store sold everything you need for Sado including Matcha! If you are looking for Japanese style tableware, I would definitely recommend this place. Okay, this is the special long weekend for most people. For me, it is just another day. I was not feeling that well, but I wanted to do something fun with my hubby and gG. 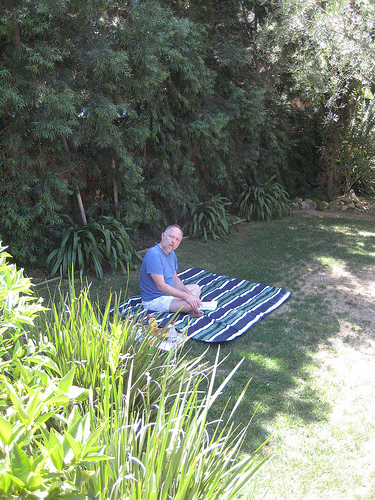 So, we decided to do a picnic in our backyard. Luckily the temperature was not too high and it was almost perfect for eating out and sleeping out. Yes, we ended up spending the whole afternoon on the grass eating, chatting, drinking (water! but could had been wine), reading, and napping. gG basically loved just hanging out with us. 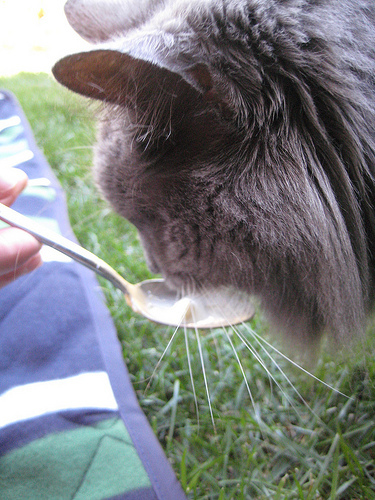 gG also enjoyed a couple of spoonful of ice cream. 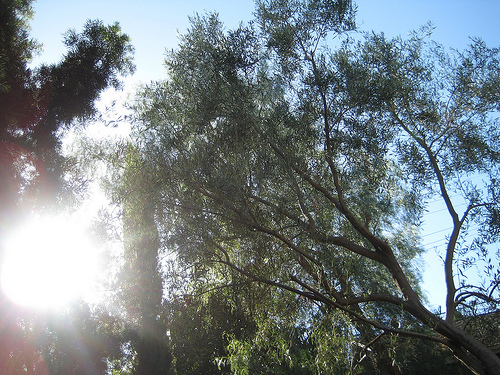 The sun was shining through our trees around 4pm. I felt the departure of summer and arrival of autumn. This red Zinfandel called Sextant recommended by Steve at The Whole Foods in Glendale was just so perfect for its price. It has a jammy blackberry flavor without faky sweetness. My kind of wine for sure. Worked well with the grilled meat. gG protecting Sakiko from vicious something - my hubby?